Some years ago, two good friends died within a few months of each other … M (female aged 63) in the plush surroundings of the private wing of a London Hospital…. the other, P (male aged 56) in a NHS hospital in the Wirral. Their personal circumstances could not have been more different. M had a very comfortable, successful professional life whereas P was one of Thatcher’s casualties, consigned to the benefits scrap heap and unemployed since the 1980s. I’m write now, because the manner of each of their deaths offer such a vivid picture of why we need to fight for the reinstatement of the NHS and a National Care Service… why privatization and financialisation of our health needs lead to the two tier contradiction of too much for those who can pay and too little for those who can’t. M became increasingly ill with ‘a mystery’ illness only a few months before her death. Eventually, she was admitted onto the private wing of a vast NHS hospital, in one of the wealthiest areas in central London. When I visited, I waited on leather bound settees, in a plush carpeted area decorated with original art works on the wall and filtered coffee on tap. I have no doubt that M received state of the art medical treatment in her palatial room, with magnificent views over the London skyline. However, when I last saw her, she was desperately phoning her husband to get onto the private health insurer because they had refused to fund the treatment that her consultant wanted to prescribe. This was only two weeks before her death. She lay prone in her bed, with oxygen feeding into her nose. Her skin colour perfectly matched that of her white sheets. But, nevertheless, she was forced into worrying about the funding for her treatment because it was above that which the private insurer could authorize and ‘their special committee would not be able to consider the claim until after the weekend’. I watched on, as she tried to explain over the phone to her husband that he needed to make the health insurer understand the urgency of the situation. Her desperate husband asked if they couldn’t just pay for the treatment outright. ‘No’ explained M. ‘The consultant says that any additional payments would invalidate the insurance plan and the insurers would then withdraw all payments for the hospital room and her care’. I cannot describe my horror at the situation. In contrast, P received the most extraordinary surgery and expert care in his NHS hospital without any financial limitation. Through a freak accident, he had managed to dislocate his shoulder and somehow ruptured his oesophagus… I never got a very clear picture of how. Nevertheless, many weeks after 3 hours of surgery and a 3’ long incision spiraling around his torso, he had ‘recovered’ sufficiently to be sent home. P lived alone, had had major surgery and yet there was no aftercare… no follow up. An extremely elderly neighbour (without a car) did a bit of shopping for him and that seemed to be it. P was a highly intelligent, well-read socialist… a friend, made online. We never actually met… so I cannot give the details as to why he did not receive help from social services or health checks from his GP… but I know that I made him contact the doctor after a few weeks when he confessed that he couldn’t eat and whenever he drank anything, it burned his whole insides! That was the first time that he’d seen a doctor since leaving hospital. Unfortunately, his oesphagus had split again and he was re-admitted to hospital for more expensive surgery. He lingered on for a few weeks before finally succumbing to a lung infection from which he eventually died. I am not for a moment suggesting that either of these two deaths resulted from medical negligence. And, there is little point in state of the art surgery if there is no aftercare in the community. Under the Tories (with the help of the LDs in coalition) we are inexorably moving towards the two tier system of the US even though they spend more per capita on health and have worse outcomes. The truth is that when there is a profit motive, the rich are over-investigated, and the poor are under-treated. Today’s demonstration may be later than he wanted but the many thousands turning out to march today must have pleased Stuart Hall. The only question is what sort of health service will we be left with after 10y of Tory asset-stripping? I know I am not alone in wondering how Labour’s most precious achievement of the NHS is being wrenched away, whilst reassured that my late parents, like the great Aneurin Bevan himself are unaware that their NHS is being sold for profit, by a government without an overall majority. Cameron said, one lie among so many, that the NHS would be safe in their hands. Their mission accomplished, it is a while since we have heard those words, “we’re all in it together.” I fear an old age without an NHS. I fear for my children and my grandchildren. I am not alone. Can you afford your local private school? Can you afford your local private hospital? Will you have confidence that they can deliver the service and support you need? You are not alone. There are more of us. Fear is not enough. There is a fight on our hands, and this is class war. There are more of us – united we stand up the stronger, divided, we fall. Weston-super-Mare is a town in North Somerset with a population of over 200,000. This was 202,566 according to Census 2011 records, ( lower than the 2010 Office for National Statistics (ONS) Mid Year Estimates (212,000) for the area.) 20% of Weston’s population is over 65. Housing development has led to rapid growth. Since 1981 North Somerset’s population has increased by 24% and is estimated to be 234,000 by 2021.The town is represented by John Penrose (Conservative MP), yet there is extreme poverty and deprivation in parts of Weston and poor health. In terms of the Indices of Deprivation (ID) 2010, North Somerset has 15 areas in the most deprived quartile in the country. All of these areas are in Weston-super-Mare. For the first time in North Somerset we have areas within the most deprived 1% nationally, and the least deprived 1% nationally. This result in North Somerset having the 7th largest inequality gap. Clearly, we are not all in it together. It has been acknowledged that action is required by the NHS and council to plan services for the predicted growth in the population, particularly in the older age groups. The story is looking very different. Modernisation and expansion in the town led to a new hospital being built in 1986 to replace the Victorian hospital which no longer met the needs of people. While Bristol is some twenty-three miles away, Taunton is thirty-three. 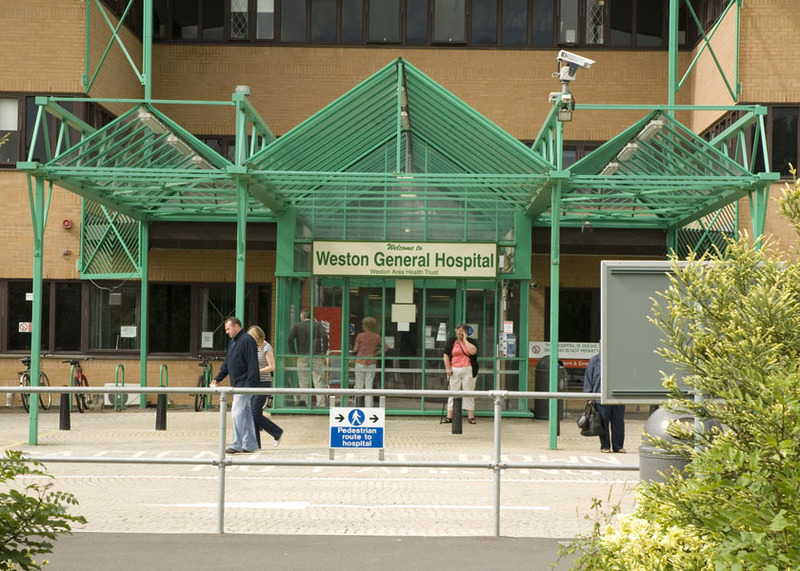 Weston needs its own hospital more than ever today, but rather than invest, and improve, Weston General Hospital now is planned to be sold off – all for profits, and A & E closed down as too costly. With some of the poorest families in the country, and a higher than average elderly population, this is disastrous for the people of Weston-super-Mare. Our aim is to protect and promote the principles of the NHS, which have enabled it to provide the world’s most efficient and comprehensive health service for almost 65 years. Those principles are now under threat, as a result of the Coalition government’s fundamental reorganisation programme, and their decision to promote the interests of private health care providers, over the interests of the general public. What local people need to realise is that putting Weston General Hospital ‘up for sale’, is just the start of a process which, unless we challenge it, will lead to us losing more and more local services, and having to travel to Bristol or Taunton for the treatment and care which is currently available here. One in ten A & E units are now under threat nationally, as a massive £20bn is cut from the NHS budget – and many have already closed with devastating results. Statistics show that when people have to travel further for A & E treatment it doesn’t just cause inconvenience, it costs lives. At Newark, in Nottinghamshire, there was a 37% rise in death rates after the local A & E department was closed, and the pattern is being repeated up and down the country. We need to warn Weston residents that there is a real risk that we could lose local children’s and maternity services, and even our A & E department, within the next few years. It ought to be unthinkable that a town with a population and catchment area the size of Weston could face such a fate, but this is what is happening to similar communities all over England. Only 60 miles down the road, Cheltenham’s A & E department already has ‘urgent cases’ redirected to Gloucester between 8pm – 8am, and many local NHS staff there are predicting that it’s only a matter of time before the department is downgraded to a minor injury unit, or closes altogether. Children’s and maternity services there have already been downgraded, as cutbacks start to bite. The first priority now is to ensure that Weston Hospital remains within the NHS – as a sale to a private company will mean that only those health services which make a profit will be retained locally. However, people should understand that whilst merging with another NHS organisation (where patients, not profit, are the priority) is better, it won’t remove the risk of the town’s hospital being significantly scaled down. Whatever happens now, people are going to have to work together and fight, if we are going to retain the services which we all need and rely on. 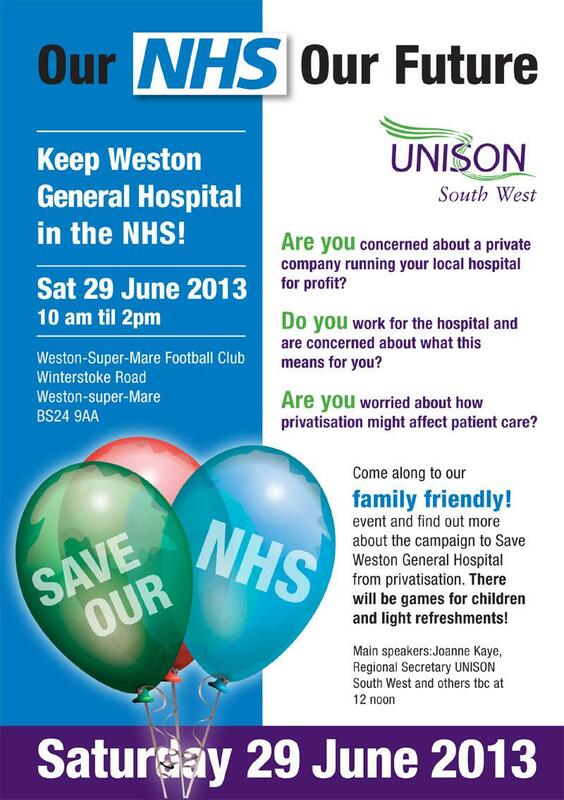 Unison is holding a public meeting about Weston General on June 29 at Weston-super-Mare Football Club. Weston-super-Mare Labour Party is actively campaigning in the area, and has launched a is running an on-line campaign. Please sign the petition. There is a FaceBook group Save our NHS. John Penrose has gone on record saying that he believes the people of Weston will not “care two hoots” who runs Weston Hospital. While public money and taxes pay out, companies such as Circle could rake in profits. Their priority would be to their shareholders, not to quality patient care. As with other privatised public services, hospitals and care, private over public does not mean better care for patients, it means better profits for the rich. It will lead to a two tier service. A & E services could be closed, and increased travel in emergencies would increase mortality risk. People will die for profit.. that’s the real ‘bottom line”. It is well proven that the old line “Private Good: Public Bad is a fallacy: ( see Public Service: Private Profit, Think Left). As with other privatizations, the government’s strategy is to brainwash people into believing that a service is falling, and private companies, are all out to rescue them like Batman and Robin… on reflection, perhaps “robbing’ is more in line with the truth, simple asset stripping with no care to consequences. The NHS has said it will not refer patients to a private hospital following a scathing assessment of the chaotic and dangerous conditions that led it to suspend children’s surgery. The Mount Alvernia hospital in Surrey, run by BMI Healthcare, one of Britain’s biggest private healthcare providers, agreed to suspend surgery .. after the damning Care Quality Commission (CQC) report. Care failures cited by the CQC report included a surgeon who operated without gloves in blood-stained shirt sleeves, and a child who was not seen by a paediatrician for seven hours despite their condition deteriorating. Do you recall Southern Cross’ closure of Care Homes because.. there was no money to be made. Profits are the Priority. Poorly paid staff working for a pittance. Dirty conditions, lack of dignity. Poverty. Care homes closed resulting in homeless, resulting in unnecessary deaths. And for what? So the rich can profit. As if they didn’t have it all already. (See The Ultimate Theft, Think Left). No, Mr. Penrose (Conservative MP), it’s not that we don’t care “two hoots” for our NHS. While you may have an eye on a ministerial position, you turn your back on ordinary people. They care more than you realise. The Labour Party has pledged to scrap the NHS market. We will not wait until after the election. We need to stop it now. Please show solidarity, wherever you are, whether that’s in Weston, Nottingham Mid Staffordshire, Lands’ End or John-o-Groats, it affects us all. Save our NHS: What Happens when you close a local A&E Hospital:? People Die. Save our NHS: The Campaign to Save Weston Hospital has started. The UK has two welfare states. There is one that is reported and endlessly discussed, and another, which is rarely mentioned. Whilst the first is suffering enormous cuts under the Tory/LD coalition, the other just keeps expanding. Governments on the left and the right can always justify welfare cuts by pitting, for example, mobility scooters against needle exchanges, or the soft-play area in children’s playgrounds against an old people’s home. Who deserves it most, they say, students or cleaners? Old or young? But when we’re running not one, but two welfare states, that’s a totally fake scenario. The real choice is between playgrounds or gas rigs; between Meals on Wheels or The City of London Currency Speculators’ Maintenance Allowance. There’s a connection – never mentioned – between, let’s say, Britain’s eight new deep-water gas rigs and its 200 new food banks. The connection is that the $4.5 billion subsidy package being doled out to transnational gas corporations is a very big slice of the welfare pie. And to keep the gas transnationals on the benefits to which they are addicted, hungry humans have to queue for tinned food that is too close to its sell-by date to be kept on the shelves of supermarkets, many of which are themselves massive recipients of corporate welfare. Not only does the UK pay out unemployment benefits less generous than Romania, Albania and the US, but the wages of the employed have simply not kept pace with productivity over the last 30y. Meanwhile, the corporate sector sits on a colossal cash surplus of £800bn but without investing because the real problem continues to be the lack of aggregate demand… and the richest 100 UK citizens, only 0.0003% of the electorate, now have wealth estimated at £257bn. Nevertheless, George Osborne has been prepared to cut £18bn from benefits plus a further £81bn from public services in the name of unavoidable austerity, whilst at the same time providing huge subsidies, tax cuts and removing regulation for the hidden ‘welfare’ system that benefits the private sector. No goods or services are directly returned to the government in exchange for these expenditures, although of course, politicians will argue that they’re stimulating the economy, helping struggling industries, creating jobs or funding important research but actually this is just a corporate welfare system. There is no reason to think the situation is different in the UK. However, overall statistics for the UK corporate welfare budget are hard to discover .. and the variety of different subsidies are staggering. Needless to say, our MSM focuses its attention on fraud and waste in the social welfare budget. Welfare fraud and waste is never far from the top of the UK’s news agenda – but the real figures often bear almost no resemblance to popular belief. The British public, for example, think around 27% of the welfare budget is lost of fraud, according to TUC research. The Department for Work and Pensions’ latest data on fraud and error in the benefit system shows a very different reality: fraud exists, but at a far lower level than the public believes – and is outweighed by errors from claimants and officials alike. The UK’s 100 biggest public companies are running more than 8,000 subsidiaries or joint ventures in onshore and offshore tax havens, according to research published on Monday, raising fresh concerns about the full extent of corporate tax avoidance. The figures, published by the charity ActionAid, show that only two of the companies listed on the UK’s FTSE 100 have no subsidiaries in tax havens – while companies such as Barclays and Tesco own hundreds. Could this be the same Chancellor who in his 2012 budget offered multi-nationals which opened a finance subsidiary in a tax haven a reduction in corporation tax from the then rate of 23% to an eye-wateringly low level of just 5.5%? It could be, and it was. Is this the same Chancellor who, whilst ultimately controlling the UK Crown Dependencies and Overseas Territories which constitute up to half the world’s most frequently used tax havens, declined to take any action to close them down? Yes, it was again. It was revealed recently that only one in four of the UK’s top companies pay their taxes, meanwhile they receive tax credits to the tune of hundreds of millions of pounds funded by people who did pay their taxes. … vastly profitable large chains of supermarkets … get an enormous subsidy to help with one of their major overheads, staffing costs. This is because many employees in these large and successful companies are paid only the minimum wage. And because the current minimum wage is not a living wage, nearly everyone on it has to claim tax credits to be able to make ends meet. Those tax credits are funded by the taxpayer…. Let’s stop calling them “wealth creators” and start calling them state subsidised industries. Currently, it is estimated that the government has already provided £43.5bn in various subsidies including the National Infrastructure Plan, the Equity Loan and Help to Buy schemes, the Enterprise Finance Guarantee and the Regional Growth Fund, with nothing to show for it. Far greater sums are in the pipeline, up to £310bn. It is more important to [the Tory/LD coalition] to privatise everything they can in pursuit of their real objective of a fully marketised State rather than to compel these banks, of which the taxpayers own 82% of RBS and 39% of Lloyds, to prioritise lending to industry to kickstart the economy and get growth going at last. Even more significantly, an enforced sale before the election will at their current share value lose taxpayers £24 billions! That is truly staggering when Osborne has been prepared to cut £18bn from benefits plus a further £81bn from public services in the name of unavoidable austerity. Yet at the same time he is now disposing of assets which will gratuitously lose the public coffers £24bn. It is arguable that without the state’s support the banking sector would have collapsed entirely. But even on the most favourable comparison from the low-point of the recession the subsidy has been hugely inefficient. A £1,020bn hand-out to the banks has yielded an increase in output over that time of approximately £40bn. It would have been far more efficient if the state had directed its own capital into the production of banking services, via fully nationalised and controlled banks. .. if you spend £100 on healthcare in the NHS you get one hundred quid’s worth of healthcare less about 5% management costs. In the private sector you’ll get a hundred quid’s worth less 3% management costs, 5% profit, 12% to pay bank loans and charges, plus a chunk for bonuses, dividends and return for investors. And, no provision for what happens if they go broke or get fed up. The ‘Too Big to Fail’ subsidy: The government now provides a public guarantee, effectively insurance against banks going bust. This gives banks a huge commercial advantage over other firms in a market system. It means banks are able to borrow money much more cheaply than if they were not ultimately underwritten by the public. Exchanges with leading auditors in front of the House of Lords Select Committee on Economic Affairs in January 2011 confirm this. A conservative analysis reveals that this hidden subsidy could be worth £30 billion annually. It means that bonuses to senior staff for ‘performance’ and dividends to institutional investors are at least in part a straight transfer from the taxpayer. The quantitative easing windfall subsidy: When it was decided that the economy needed more liquidity, the Bank of England pumped money in using the technique called ‘quantitative easing’. To meet various, and sometimes self-imposed, requirements, it did by purchasing government bonds through investment banks. Merely for being passive conduits for this ‘risk free’ arrangement the banks took a cut of every trade. Here nef analysts found that banks enjoyed a significant windfall, but that lack of transparency keeps the likely amount hidden. The ‘make the customer pay’ subsidy: Looked at sympathetically, the banks have been put in a difficult position. At the same time as being required to rebuild their capital, they are also under pressure to lend. In response, the banks have tried to manage this by increasing the gap between what they have to pay to borrow money, and what they charge people to borrow from them. This is the so-called interest rate ‘spread’. But the banks have a choice. They could recapitalise by reducing or eliminating bonus and dividend payments until their capital base is rebuilt. As it is, the taxpayer is subsidising the banks twice over: once through taxpayer funded public support to the banks, and secondly through paying much higher interest to borrow than the banks do. This hidden subsidy to retail banking and one part of the investment banking world amounts to at least another £2.5 billion each year. There is no common good, no public purpose, no shareholder’s interest; we are the prey and governments as well as corporations are run by and for predators. Furthermore, none of this is likely to get any better under the rules of the US-EU FTA (Free Trade Agreement) which the Tory/LDs are wanting to get signed by 2014. Part of the secret negotiations are the transfer of sovereignty from nations to private corporate tribunals who will be empowered to compel governments to change their laws or pay unlimited fines.